Feel free to copy this work for desktop use and/or your individual study of instrument making. You may not republish all or any portions of this work in any form, or distribute it in any form, without permission. You may establish electronic pointers or links to this page. Questions, problems, comments or requests for permission to reprint may be e-mailed to me by clicking here. In the coming weeks and months this method will be expanded into a detailed, step-by-step method any novice can use to build a Concert D uilleann chanter reed from scratch. 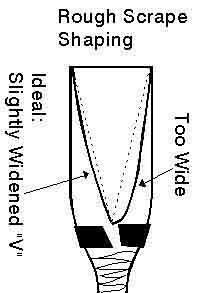 Specific dimensions will be given for Penny-Chanters, but any Concert D chanter should be reedable if the dimensions specified by its maker are substituted for mine. For now this will be a brief outline, for semi-experienced makers to use, of variations to standard methods such as those given by Dave Hegarty, Seth Gallagher, David Quinn and other reasonably traditional methods for Concert D chanter reeds found online and in print form. Only one part of any such method needs to change, and in addition, much of the early work for some of them becomes much less critical. Traditional reed methods create a great deal of stress in the cane which artificially--and temporarily--makes it act stiffer than it really is when first finished. All such methods recommend allowing considerable resting periods after assembly and again after first scraping, so that this stiffness will relax away before the reed is finished. 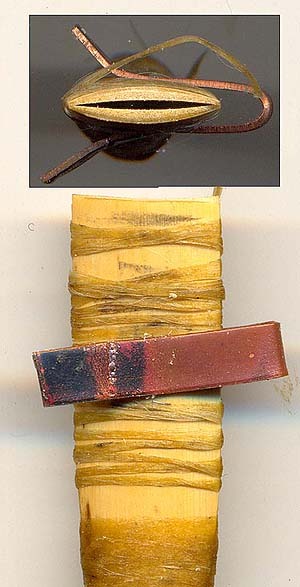 These temporary stresses make the true state of the reed unknowable until well after the reed is sold and put into service. 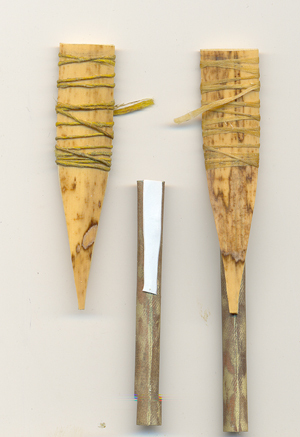 Much of this problem can be avoided in quick-built reeds by heating the cane after initial assembly, which temporarily softens it allowing it to settle permanently into its longterm shape with much of the stress relief of traditional slow construction forced in the beginning before the reed is voiced. If high, heat 2-3 more minutes and check. Tops of tails 1 1/4" from ends. For shorter slip, maintain center length between tail tops 2 1/4"
Use different sized sanding cylinders for strips of cane with different o.d. along the bark surface. Discard strips with OD's greater than 1" or less than 7/8"
Be willing to make centerline thinner, down to .035" for harder or stiffer cane. Heat treatment will cancel out those issues. Push staple most of the way in. If there's too much resistance, rest 10 minutes, push a little more. View lips. At this point elevation gap should be same thickness as blade ends. If gap is much less than blade end thickness, gouge inside of tails to reduce staple pressure. 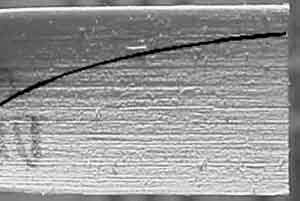 Penny-Chanter was developed and tuned for tapered, not straight-tube, staples. Wide end .620", narrow (eye) end .035" - .040"
Or tapered tubing made from straight tube annealed, spun on mandrel to same taper as rolled staples. 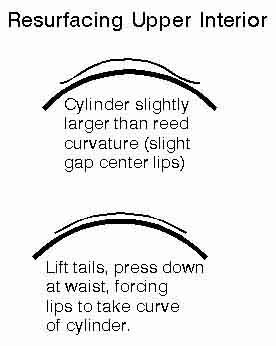 Gap should be less than thickness of either lip. 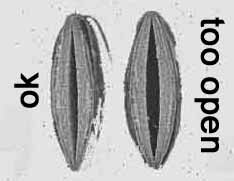 For less than .030" - .025" , reed will remain too stiff and resistant after scraping. If elevation remains too high or springs more open after treatment. Fit a quick temporary closing-type bridle midway up the blades. Reed is Safe to Scrape Near to Completion Any Time after it cools. 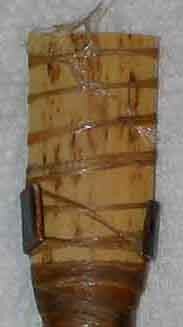 Goal: chanter reed should be slightly arched across the grain, not flat like regulator reed below. Here's a way to begin. When scraping is about 2/3 finished, reed still strong, fit bridle and close near to playing elevation. 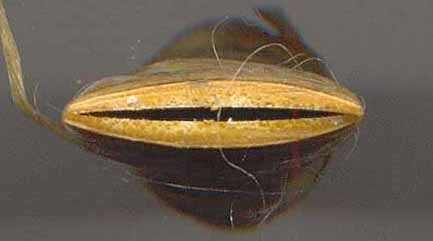 Bridled reed can be sanded against a flat. 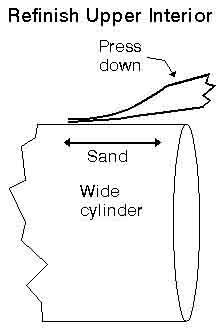 Sand both sideways and along the grain. But gradually tip to one side, level, then to other side. 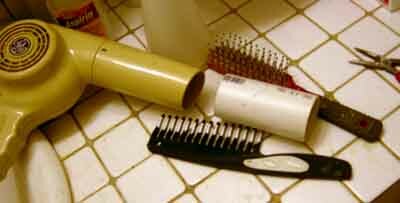 Leave a little strong and sharp, possibly squeaky, too strong to use with full set going. 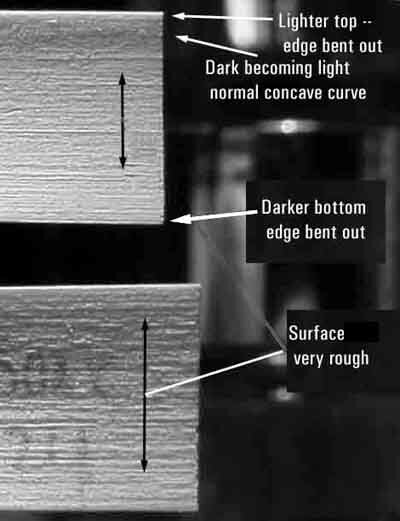 If elevation gap is is too low, gouge inside of tails to reduce staple pressure. Gouge settled tails only slightly--a little will make a great difference. Let reed rest overnight or play for 20-30 minutes before further evaluation. As final strength nears, allow several days' settling and playing between finishing steps. Scrape or sand a little if necessary--never more than half the amount seemingly required. Take reed apart to diagnose and repair--heat settling makes this safe. Resurface lips with fine sandpaper on large diameter cylinder 3 1/4 " - 3 1/2 "
Then light pressure, hold blade level, to smooth only the very top end. Thin these areas carefully on the thicker corner(s).